Bogatsky was born at Lodz in Russian Poland into a Jewish family. He became a student in Zurich, Switzerland from where he was expelled on 29th July 1910 for his contributions to a German language anarchist paper Arbeiter-Wille subtitled Syndikalistische Monatsschrift der Deutschen Schweiz -Worker’s Will- Syndicalist Journal of the German-Swiss(2 issues). He appears to have continued to live in Switzerland and be active in the exiled anarchist movement. In spring 1917 he was the secretary of the "Central Swiss Committee for the Return of Political Emigrants to Russia." He took part in organising the return to Russia of members of different revolutionary currents including, from April to May through Germany. In autumn 1917 he himself returned to Russia and was active in Petrograd and Kronstadt. There he organised the small grouping the Union of Independent Anarchists He was one of the editors, along with Bleikhman and the Gordin brothers, of the anarchist paper Burevestnik (Stormy Petrel) which first appeared on November 11th, 1917 with a print run of 15,000. In late November disagreements in the editorial group led to the departure of Bogatsky. Bogatsky propagandised against any involvement in the Constituent Assembly, writing the statement To the comrades of the workers and soldiers, peasants and sailors! in Burevestnik No2, November 12th, 1917. He wrote: “The Constituent Assembly is the last hope of the reaction. Participating in elections, you bind yourself hand and foot. Voting, you are responsible for the upcoming rout of the revolutionary organisations…. Going there, you unite with the worst enemies. Going there, you kill the Soviets. Going there, you yourself bury the revolution……Election Day will be a day of defeat! So let all conscious comrades abstain from the elections, not voting for anyone”. Bogatsky was one of the half dozen anarchists on the Petrograd Military RevolutionaryCommittee, set up by the Petrograd Soviet in the second week of October 1917 to organise the armed rising against the Kerensky regime (the others were Bill Shatov, Akashev, Bleikhman, Drugov, Yarchuk). Bleikhman was later to state that 500 anarchists were involved in the action, with armed detachments led by Anatoli Zhelesnyakov and Justin Zhuk. 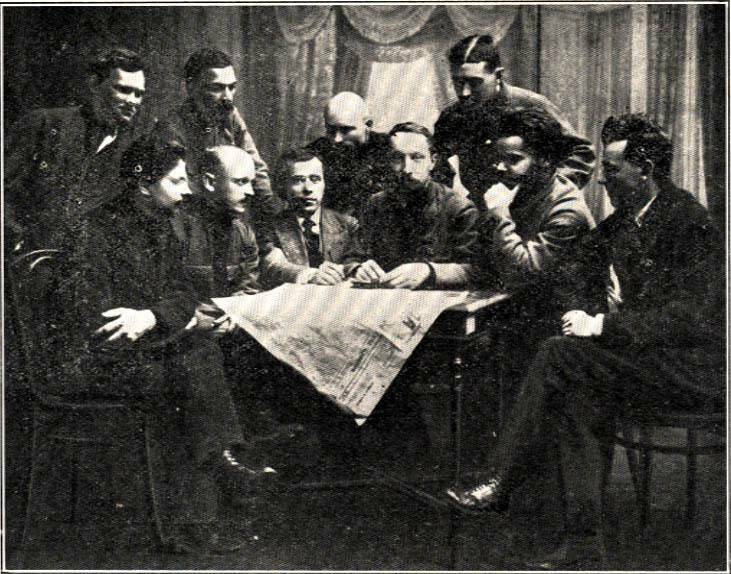 At the second conference of the Petrograd Federation of Anarchist Communists he was elected to to the Commission to prepare an All-Russian Congress of Anarchists. Speaking at the conference, he emphasised the need for anarchists to get involved in the soviets and factory committees. He advocated cooperation with the Bolsheviks jointly to fight counter-revolution and German intervention. On the 1st March the Petrograd Federation delegated him to the Committee of Revolutionary Defence of Petrograd to argue for the rescinding of the decision of this committee not to deliver arms to anarchist detachments. With the Brest-Litovsk treaty Bogatsky founded a paper Chernoe Znamia (Black Banner) in Moscow along with M. Krushinskaya. Witold Brzostek, the husband of Maria Nikiforova, also seems to have been involved in this paper. It polemicised against the treaty. As a result, the paper was banned by the Bolsheviks and Bogatsky and Krushinskaya were forced to flee Moscow. According to some historians Bogatsky was then involved in the setting up of the Underground Anarchists who had decided to physically resist the Bolsheviks. We know nothing of him after 1923, and it is highly likely that he was executed or perished in prison or the camps.